For the first time in a while I had absolutely no plans this weekend, so I spent it doing exactly what I wanted - meeting my friend Kate for a drink and snack at Rosie's, catching up on reading (I'm currently reading Fates and Furies by Lauren Groff - it's beautiful! ), making the most of the perfect fall weather by going on runs down at the Brooklyn Bridge park, and doing a lot of baking and cooking. I've been wanting to try making some sort of candy for a while now. I have a bunch of ideas but wanted to do something easy by starting with a simple recipe. Peanut butter cups are a guilty pleasure of mine so I was off to the races. I combined dark and milk chocolate for a rich and indulgent candy and then topped them off with some sea salt. I love them and am currently snacking on some. However, I'll be taking them into work this week so I don't eat them all. These peanut butter cups are perfect to give as a gift too. Next up, truffles! Mix peanut butter, butter, and sugars together in a small bowl. Set aside. In a double boiler, melt chocolate until smooth. Using teaspoon, fill cupcake liners until the bottom is full. Set aside and let harden for 10 minutes. Using hands, roll peanut butter mixture into nickel-sized balls and flatten. Lay peanut butter disk on top of chocolate in each cupcake liner. 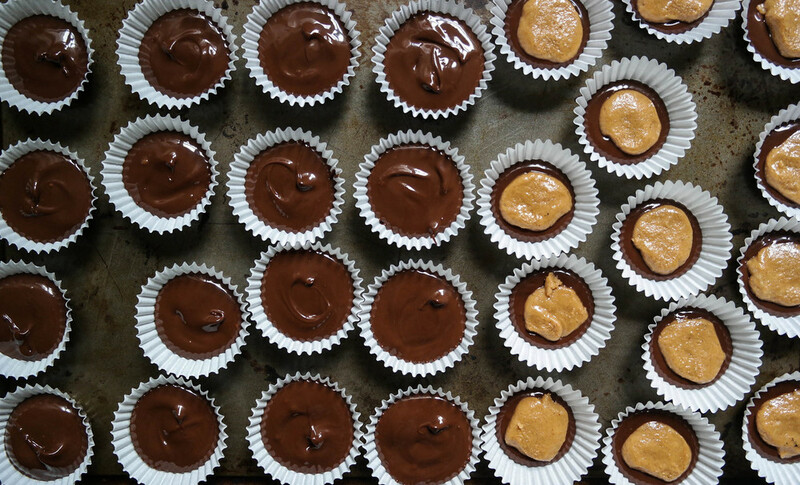 Add more chocolate to each cupcake liner so that the peanut butter is covered. Using a popsicle stick (or something similar) smooth out the chocolate so it’s even and sprinkle each peanut butter cup with sea salt. Let cool in refrigerator for several hours before eating.